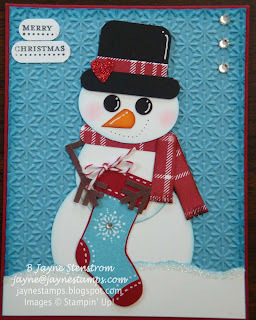 When you see today's card, you're going to squeal at it's cuteness! I saw this card at Deb Daam's house when we got together last month. I think it's a card that she got in a swap, so I'm sorry that I don't know the creator to give her/him proper credit. If it's you, please let me know so I can acknowledge you. So are you ready? (drum roll please...) Here it is! Isn't it just adorable, stinkin' cute, and all of those things rolled up together? I love it! I think the snowman is getting ready to hang his stocking up for Santa. What do you think? Since I haven't made this card (yet), I'll have to guess on the supplies, but I can give you a list of what I recognize from looking at it. It uses the Snow Burst Textured Impressions Embossing Folder (TIEF), Stitched Stockings stamp set, Stocking Builder Punch, Punches: Snowflake, Circle Punches (I'm guessing our three largest sizes), Word Window, Heart to Heart, 3/16" Corner Rounder, Red Glimmer Paper, Basic Rhinestones, Teeny Tiny Wishes stamp set, Cherry Cobbler Baker's Twine, White Gel Pen, Frostwood Lodge DSP, 2-way Glue Pen, and Dazzling Diamonds Glitter. This card just makes me smile when I look at it! 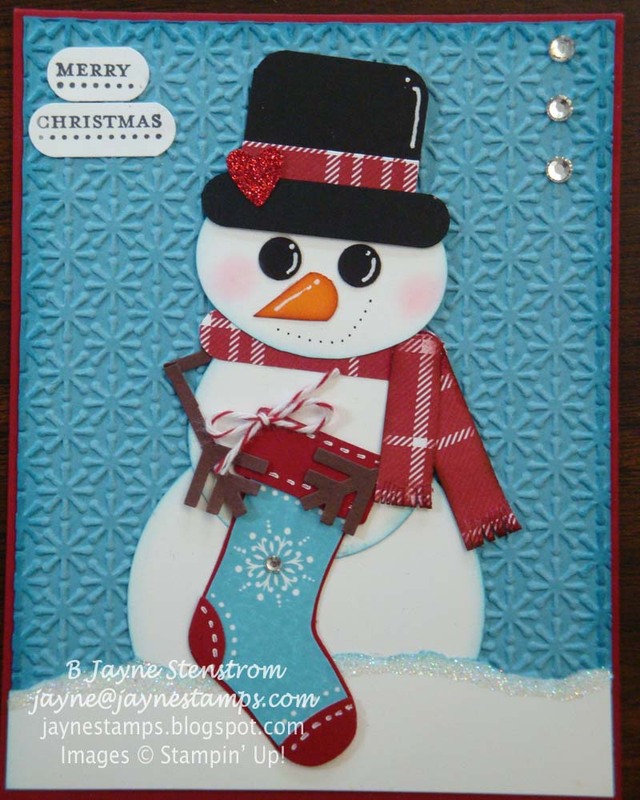 And since we got some snow today, it seems very appropriate to be showing you a snowman card!